A pacemaker is a small electronic device that is implanted under the skin to help regulate the heart rhythm. Most pacemakers are implanted to treat symptoms resulting from bradycardia (slow heart rate) caused by sick sinus syndrome or heart block. Having a pacemaker is supposed to eliminate or prevent problems, not cause them. Generally speaking, that is what they do. Having a pacemaker should not significantly alter or disrupt your life. As long as you follow a few simple precautions and follow your doctor's schedule for periodic follow-up, your pacemaker should not noticeably impact your lifestyle in any negative way. Here's how they work. Pacemaker implantation is minimally invasive surgery. The typical recovery period is not lengthy or difficult. You may experience pain at the incision site for a few days. Your doctor may ask you to restrict vigorous activity or lifting heavy objects for a week or two. The incision site is usually completely healed after two or three weeks, and you should have no further restrictions. During this initial period, you should watch for signs of bleeding or infection, such as swelling, increased redness or worsening pain, and let your doctor know if any of these signs occur. Fortunately, these complications are infrequent. You will need to have your pacemaker checked periodically to make sure it is functioning normally and its battery has plenty of energy. Usually, these pacemaker checks can be done from home, wirelessly, using a special device your doctor will give you for remote follow-up. You will also be checked in your doctor’s office once or twice a year. When the battery begins to run out, usually after five to ten years, your doctor will schedule an elective pacemaker replacement. This is a relatively simple procedure, carried out under local anesthesia, in which your old pacemaker generator is detached from its leads and thrown away. A new generator is then attached, and the incision is sewn up. Generally, the pacemaker leads never need to be replaced unless they develop a problem. Here's more about pacemaker generators and leads. 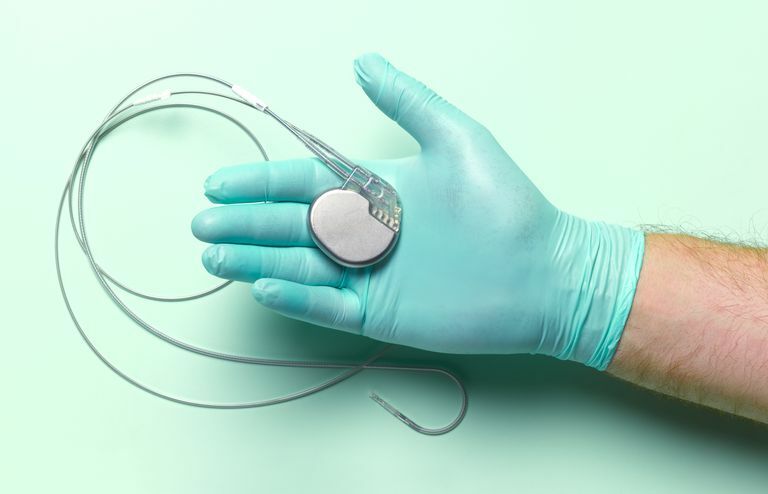 What Precautions Do You Need to Take with a Pacemaker? Cellular telephones: Cellular phones, if held close to the pacemaker (which may happen if the phone is kept in a breast pocket) can potentially affect the function of a pacemaker. But as long as the phone is kept six inches or more away from the pacemaker there should not be a problem. Magnets: Similar to cell phones, magnets can affect a pacemaker if they are brought to within six inches or so. Simply keep magnets away from your pacemaker. Anti-theft detectors: The walk-through, anti-theft detectors in stores work by generating electromagnetic waves, which can momentarily interfere with the function of a pacemaker. However, as long as you walk through the detector normally (and don't stop or pause inside of it), you should not experience any problems. So, when you encounter one of these devices, just keep moving right through it. Airport security metal detectors: Your pacemaker may set off the walk-through metal detector commonly used in airport security. The metal detector will not affect your pacemaker. But a potential problem is the hand-held scanner the security agent may use on you after you set off the metal detector. The hand-held scanner contains a magnet that may interfere with your pacemaker when it is brought near. Before you go through airport security, you should tell the agent that you have a pacemaker and that he or she should not use the hand-held scanner near your pacemaker. Airport security full-body scanners: The full body scanners at airports (the devices that make an image of your body) apparently will not affect your pacemaker, but there is surprisingly little objective evidence available on this issue. You can read more about full-body scanners and pacemakers here. Arc welders and chainsaws: Unlike household appliances, arc welders and chainsaws are powerful enough to interfere with the function of your pacemaker. People with pacemakers should avoid using this equipment. MRI scans: MRI scanners can interrupt the pacing function of a pacemaker; under some circumstances, they may actually damage the device. Problems with an MRI can be avoided by taking special precautions during the MRI procedure, as well as limiting certain types of MRI scans. If you have a pacemaker and need an MRI, you should carefully discuss the risks and benefits with your doctor. Radiation therapy: The powerful radiation used in radiation therapy for cancer can damage the circuits of a pacemaker. If you need radiation therapy, your pacemaker will need to be specially shielded to protect it from the radiation field. Other medical procedures: Pacemakers can also be affected by lithotripsy, which uses sound waves to treat gallstones or kidney stones; transcutaneous electrical nerve/muscle stimulators (TENS), which are used for pain control; electrocautery, which is used during surgery to control bleeding; and diathermy, where electromagnetic radiation or microwaves are used to heat tissues. In general, it makes good sense to remind any of your doctors that you have a pacemaker before they do any medical procedure. Pacemakers are supposed to improve or maintain your lifestyle, not limit it. And for the most part, this is what happens. Once you recover from the implantation surgery, none of the precautions you need to take are particularly burdensome, and you won't encounter most of them during your daily life. For the most part, once your pacemaker is implanted, you can go through your normal life without ever thinking about it. Epstein AE, DiMarco JP, Ellenbogen KA, et al. ACC/AHA/HRS 2008 Guidelines for Device-Based Therapy of Cardiac Rhythm Abnormalities: a Report of the American College of Cardiology/American Heart Association Task Force on Practice Guidelines (Writing Committee to Revise the ACC/AHA/NASPE 2002 Guideline Update for Implantation of Cardiac Pacemakers and Antiarrhythmia Devices) developed in collaboration with the American Association for Thoracic Surgery and Society of Thoracic Surgeons. J Am Coll Cardiol 2008; 51:e1. Hauser RG, Hayes DL, Kallinen LM, et al. Clinical Experience with Pacemaker Pulse Generators and Transvenous Leads: an 8-year Prospective Multicenter Study. Heart Rhythm 2007; 4:154.